Had a great week meeting and seeing lots of people in the startup community in London. Using Airbnb to secure a small appartment in Shoreditch I was well positioned to move around by foot, taxi, bus and underground. The Bulgarian cleaning lady handed me the key and for three days the place would be mine. Shoreditch is located northeast of the City and is a area of a rough beauty, filled with interesting shops, bars and restaurant. A bit like the Village in NYC or De Jordaan in Amsterdam. 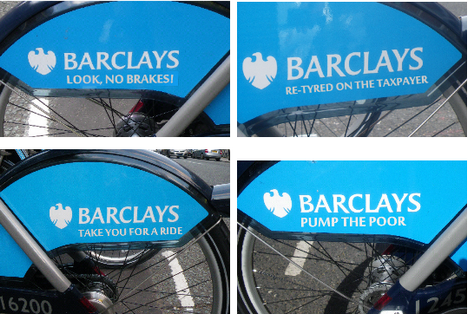 I tried to unlock a Barclays Cycle Hire Bike but the description on the bikeholder was impossible to understand. In the -hardly comforting- believe that they sinned against the ‘Don’t make me think’ principle I gave up. After wandering around the streets for an hour I settled into an Indian restaurant and had a very hot curry. It was delicious. My first (official) meeting was on Wednesday morning with Rupert from teamup, we decided to have breakfast in Albion, a friendly and very ecological ‘caf’. My wife Irene is a yoga teacher and we are in the process of installing a ‘mini-ERP’ for her yoga studio. Eventually we opted for teamup, an effective and easy to use webapp, and this morning we discussed implementation, desired new features and startup marketing in general. Rupert is running the business for around a year now, with two partners, developers Tom and Matt in San Francisco. An important reason we chose for teamup is their dedication to go the extra mile to help their users -mainly fitness and yoga studios now- succeed. Excellent support, even outside business hours. After several ‘dry-cappucinos’ we went our ways and arranged to meet next day to tie up some loose ends. I had the afternoon to myself and walked in the direction of the city and visited Rough Trade recordshop in Brick Lane. They sell records and everything else but I especially liked their technology corner where you can find a lot of cheap and smart tech stuff to build your own Arduin computers, solar systems, wearable digitals and the rest. At night I made my way to Cargo where the Seedcamp party would be that night. Immediately at the door I ran into the mobile app of Seedcamp participant Gateme. Gateme have targeted a market they believe to be untapped so far, screaming for a good entry management system – nightclubs. Their system manages guestlists, tickets & tables and distributes money to promoters. My name appeared on the iPad screen and properly washed, shaved and tagged (‘investor’ as there were no ‘mentor’ stickers) I could enter Cargo and tried to find the bar. With a beer in my hand I went outside to the backyard and ran into my buddy Joao of Startup Lisboa. He was in a lively discussion on startups and money management with fellow-Portuguese Celso of Simple Tax and Jorg, CMO of Paymill from Munich. Thursday was Demo Day for 15 selected Seedcamp companies. Most were new to me, others I had seen before during Seedcamp Berlin and Seedcamp Lisbon. Zoe Cunningham put a great review of Seedcamp Demo Day on her blog so I won’t try to better her well written description of the teams. My favorites were Maily (email for the under 10 year olds), Bukit (helping people in heavy debt to resolve their situation) and tl;dr (too long don’t read) a webtext summarizer app from a team that claim to be ‘taming the web’. Joao pointed out that many of the new startup successes were not BtoB or BtoC, but first and foremost BtoD, short for ‘Business to Developers’. And yes, many participants were BtoD. To name a couple: bugfinder Qamine and code-keepers Codeship. At one in the afternoon the Seedcamp team had some announcements to make about the events in 2013. Not 10 meetings will be held, but 20, also in Amsterdam for the first time which is great of course. And no less than 4 Seedcamp weeks will be organised, two of them in London and two of them in Berlin. The much anticipated announcements about the investment strategy for the coming 5 years did not happen just yet. We’ll have to wait a little longer. Flew back to Holland and my beloved Eurozone. Again a wonderful week talking to creative smart and fearless entrepreneurs.